[John the Baptizer said,] "I didn't know [Jesus] was the one, but when God sent me to baptize with water, he told me, 'The one on whom you see the Spirit descend and rest is the one who will baptize with the Holy Spirit.' I saw this happen to Jesus, so I testify that he is the Chosen One of God." Our goal of spending a year in the Gospel of John is to reach this same point that John the Baptizer did! 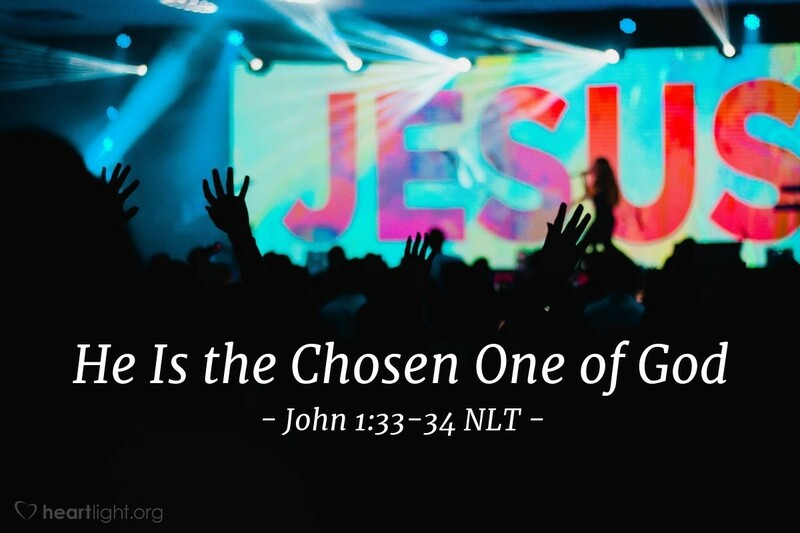 We want to know what Jesus did; so when we reach the end of this year, we can say something similar to John, "I have seen and know that Jesus is the Chosen One of God." When we realize that Jesus is a man, we also need to realize that he is more than a man: He is God with us, God's Son. Then, suddenly, everything is different! We realize we are valued by the Creator of the universe. We realize that we are not random sets of mutations, infinitesimal specks of dust in a great expanse of randomness. We are known and loved by God. He sent us his Son to be our Savior so we can be his children. O God, my heavenly Father, help me understand what it means for Jesus to be your Son. Strengthen my grip on this conviction and deepen my faith so that I can hold on to the wonder and grace you have given me by sending your Son to be my Savior and Lord. In Jesus' saving name, I pray. Amen.